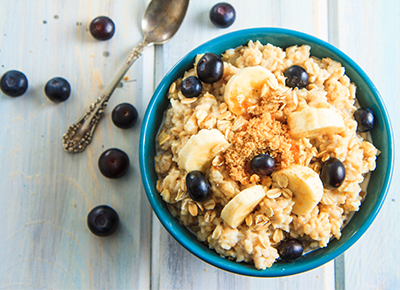 NEXT ARTICLEWait, What’s the Difference Between Steel-Cut, Rolled and Instant Oats? In our books, pizza’s pretty darn great no matter how you slice it. But if we’re going to make it at home, the results better be mind-blowing. Grilling our pies is the perfect solution: It takes less than ten minutes and makes for crackly, charred crusts that are still chewy and tender. Oh, and you don’t need a pizza stone. Here are our favorite recipes to get you started. Rotisserie chicken and a quick homemade barbecue sauce make this a meal you can pull off any night of the week. It’s technically a dessert pizza, but we might just eat this one for dinner. Shh, no one needs to know these beauties start with store-bought dough. Meet the most satisfying, savory way to cook with peaches. Whole-grain crust gets topped with ricotta, mozzarella, lemon, peas, mint and cracked black pepper. Is your mouth watering yet? Skip the sauce and layer gorgeous, juicy heirlooms on top of your mozzarella. All shapes, sizes and colors are welcome. We’re all guilty of eating cold pizza for breakfast. But have you ever made pizza specifically for the a.m.? If it has an egg on it, we think it’s breakfast-worthy. The recipe calls for zucchini, red pepper, mushrooms and red onion—but it’s OK to sub in any of your fresh summer haul. A few high-quality ingredients make for maximum flavor. Sub in store-bought flatbread for pizza crust—it makes for an extra-crispy thin-crust pizza when you grill it. The classic salad gets a gourmet upgrade. This one's topped with heirloom tomatoes and basil, so we give you permission to call it a salad. General life advice: When in doubt, add burrata. Whoa, tangy strawberries pair surprisingly well with smoky chicken. A non-boring, decidedly delicious way to put your zucchini to work. Pizza crust gets smothered in apple pie filling, topped with marshmallows and chocolate chips and grilled. Let’s just say we don’t hate it. This is our new favorite way to eat fruit salad. If you don’t feel like turning on your gas or charcoal grill, you’re in luck: You can make this one in your grill pan. You can’t go wrong with spicy corn, cotija cheese and plenty of avocado. Fun fact: When you grill eggplant, it takes on a new, buttery flavor and texture.